The constellations best seen in September are Capricornus, Cygnus, Delphinus, Equuleus, Indus, Microscopium and Vulpecula. Cygnus, Delphinus, Vulpecula and Equuleus are northern constellations, while Capricornus, Microscopium and Indus are located in the southern sky. September is the best time of year to observe a number of interesting deep sky objects located in these constellations. The best known telescope targets include the North America Nebula (NGC 7000), the Crescent Nebula (NGC 6888), the Blinking Planetary Nebula (NGC 6826), and the Fireworks Galaxy (NGC 6946). Cygnus, the northernmost of the September constellations, represents the Swan. The constellation is very easy to identify because is it dominated by a large cross-shaped asterism known as the Northern Cross, formed by the stars Deneb (Alpha Cygni), Sadr (Gamma Cygni), Albireo (Beta Cygni), Rukh (Delta Cygni) and Gienah (Epsilon Cygni). Deneb (Alpha Cygni), the brightest star in Cygnus, is the 19th brightest star in the sky, with an apparent magnitude of 1.25. Located at a distance of 2,625 light years from Earth, the blue-white supergiant is the most distant first magnitude star and one of the most luminous. It has a luminosity between 55,000 and 196,000 times that of the Sun. Deneb marks the tail of the celestial swan and the top of the Northern Cross. The star is also one of the vertices of the Summer Triangle, a large asterism visible high overhead in the summer night sky. The other two bright stars that form the Summer Triangle are Vega in Lyra, the fifth brightest star in the sky, and Altair in Aquila, the 12th brightest star. Albireo, the star that sits at the base of the Northern Cross and marks the Swan’s beak, is designated Beta Cygni despite being only the fifth brightest star in the constellation. Albireo is popular among stargazers because, when viewed in a telescope, it resolves into a contrasting pair of the amber-coloured Beta Cygni A and bluish green Beta Cygni B. 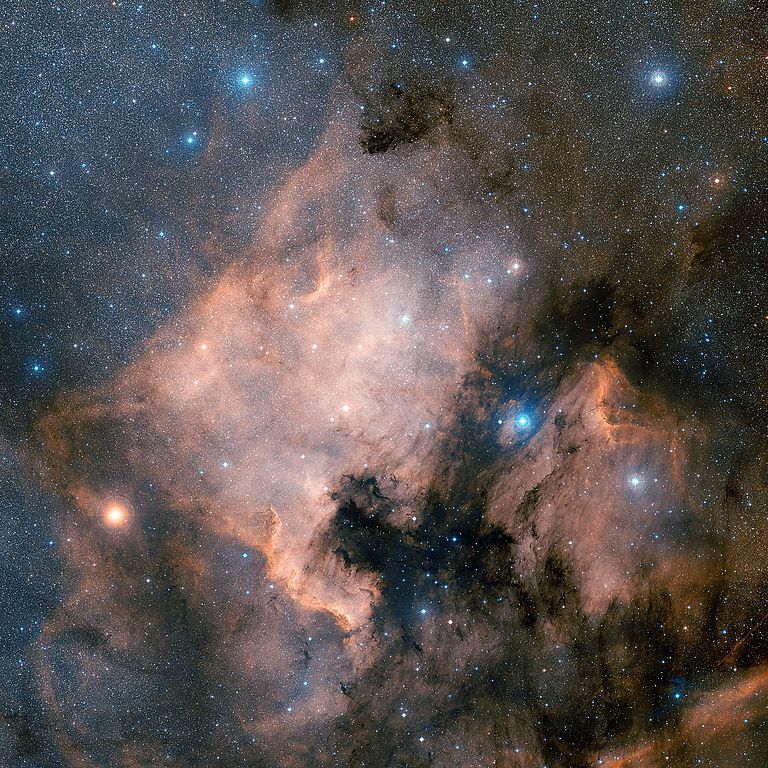 The region of the Northern Cross is home to several famous nebulae. The North America Nebula (NGC 7000) and Pelican Nebula (IC 5070 and IC 5067) are located near Deneb, the Gamma Cygni Nebula (Sadr Region, IC 1318) and Crescent Nebula (NGC 6888) lie near Sadr (Gamma Cygni), the Tulip Nebula (Sharpless 101) is found between Sadr and Albireo, and the Veil Nebula (NGC 6960, NGC 6992, NGC 6995, NGC 6974, and NGC 6979), a large 5,000 year old supernova remnant, can be seen to the south of Gienah (Epsilon Cygni), the star that marks the Swan’s right wing. 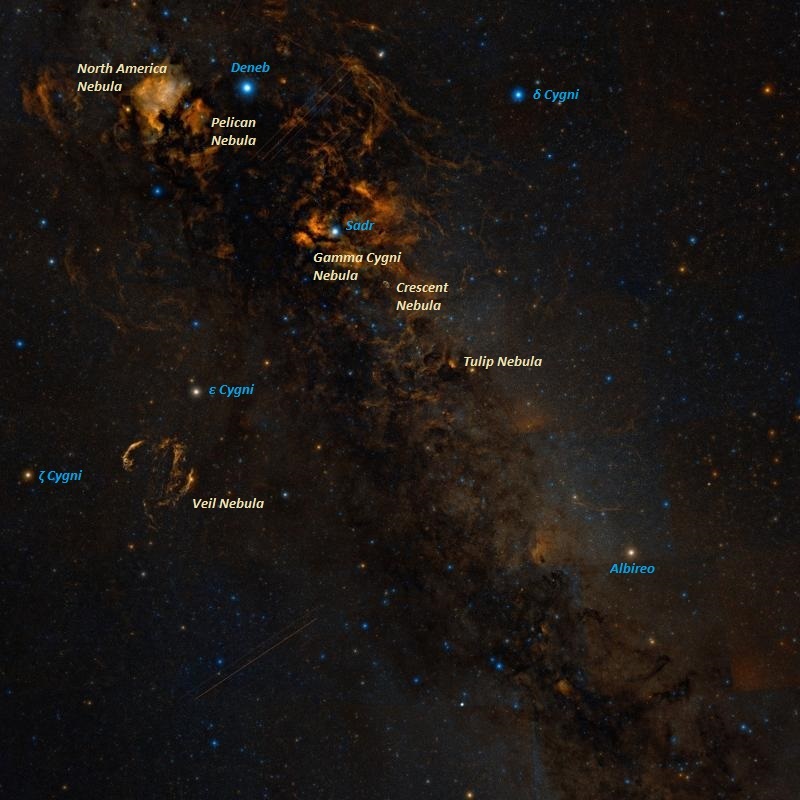 Cygnus also contains two Messier objects, the open clusters Messier 29 and Messier 39. Other notable deep sky objects in the constellation include the famous X-ray source Cygnus X-1, the Fireworks Galaxy (NGC 6946), a spiral galaxy near the border with Cepheus, the Blinking Planetary Nebula (NGC 6826), a nebula with an eye-like shape, the Galactic Ghoul (DR 6 nebula), named for its spooky appearance that resembles a human face, and NGC 6910, an open cluster nicknamed the Rocking Horse Cluster. Located within the Summer Triangle, Vulpecula is a faint, inconspicuous constellation that represents the fox. 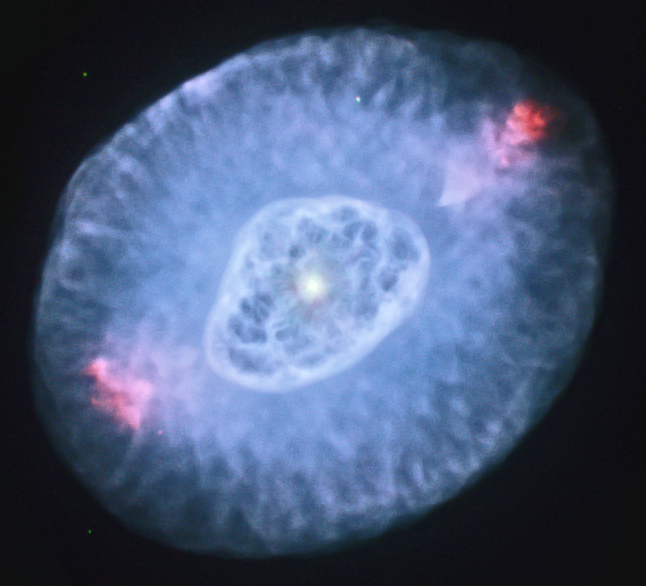 It is home to the first planetary nebula ever discovered. 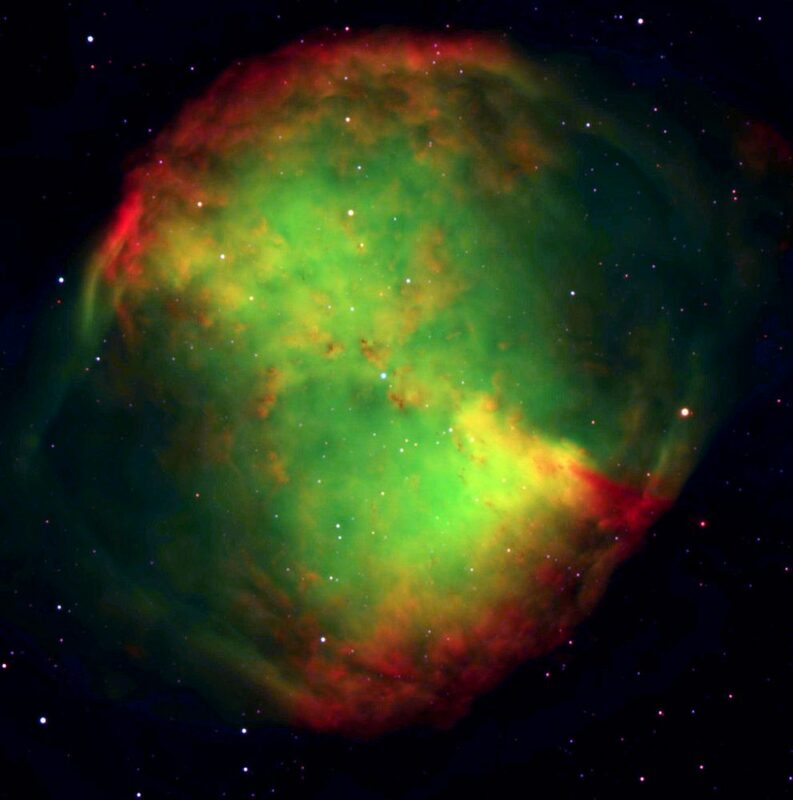 The famous Dumbbell Nebula (M27) covers an area about 6 arc minutes in diameter and, with an apparent magnitude of 7.5, it can be seen in large binoculars in good conditions. The nebula’s double-lobed shape appears only in a telescope. The only planetary nebula brighter than M27 is the Helix Nebula in Aquarius constellation, but the Dumbbell is the more popular target because it has a higher surface brightness and is easier to observe. Vulpecula also contains Brocchi’s Cluster, also known as the Coathanger or Al Sufi’s Cluster. The object was once believed to be an open cluster, but is really a random grouping of stars that form an asterism that resembles a coat hanger. Other notable deep sky objects in Vulpecula include the open clusters NGC 6885 and NGC 6823, the reflection nebula NGC 6820, the elliptical galaxy NGC 7052 and the Seyfert galaxy 3C 433. Delphinus is one of the smaller, fainter constellations, but has a distinctive diamond shape that makes it easy to identify. Its brightest stars form an asterism known as Job’s Coffin. Deep sky objects in the constellation include the planetary nebulae NGC 6891 and NGC 6905, also known as the Blue Flash Nebula, and the globular clusters NGC 6934 and NGC 7006. Equuleus, representing the little horse or foal, is another small, faint constellation in the northern sky. It rises just before the larger and brighter Pegasus constellation. Occupying an area of only 72 square degrees, Equuleus is the second smallest constellation in the sky, slightly larger only than Crux. The constellation’s brightest star, Kitalpha (Alpha Equulei) has an apparent magnitude of 3.9. The deep sky objects in Equuleus include the relatively faint spiral galaxies NGC 7015, NGC 7040 and NGC 7046. Located south of the celestial equator, the zodiac constellation Capricornus is one of the faintest ones in the sky. The brightest star in the constellation, Deneb Algiedi (Delta Capricorni) has a mean visual magnitude of 2.81. It marks the sea-goat’s tail. It is a multiple star system consisting of an Algol-type eclipsing binary star and two companions. None of the other stars in Capricornus are brighter than magnitude 3.00. Capricornus is home to Messier 30, a bright globular cluster about 93 light years across. Other notable deep sky objects in the constellation include HCG 87, a compact group of galaxies 400 million light years away, composed of two spiral galaxies and an elliptical galaxy, and the grand design spiral galaxy NGC 6907. Located between the brighter Sagittarius and Piscis Austrinus, Microscopium is not easy to make out, as its stars are only visible on a clear, dark night. The brightest star in the constellation, the yellow giant Gamma Microscopii, has a visual magnitude of 4.67. Microscopium does not have many interesting deep sky objects. It contains the faint spiral galaxies NGC 6925 and NGC 6923. The Microscopium Void, a stretch of empty space discovered in 1984, occupies an area about a half of the constellation’s diameter in size. Invisible to observers north of latitude 15°N, the constellation Indus does not contain any bright stars either. Alpha Indi, also known as the Persian, is the brightest star in the constellation. The orange giant has an apparent magnitude of 3.11. Epsilon Indi, a multiple star system with a visual magnitude of 4.83, is one of the nearest stars systems to Earth. It lies at a distance of 11.81 light years. Notable deep sky objects in the constellation are mostly galaxies. The spiral galaxy NGC 7090 (mag. 10.51) and lenticular galaxy NGC 7049 (mag. 10.7), notable for its prominent dust ring, are the brightest ones.